. . . can cause confusion because stakeholders at each stage of the process have different information needs. Without ongoing vigilance, hospitals risk a sentinel event. However, when the systems design and internal protocols include IV line and identification labels, a reduction in the unintended errors of IV line medication can occur. 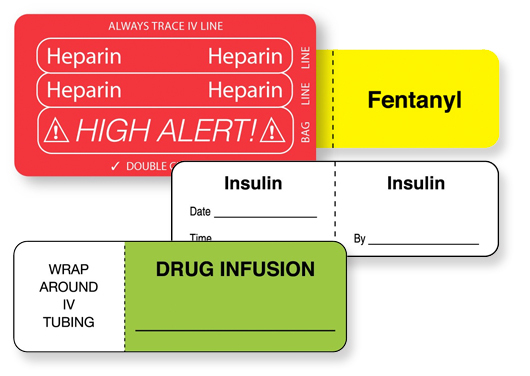 IV line and identification labels assist the medical staff and guide the right dose at the right time by the right route. Dispensing and administering standard medications or those developed through sterile compounding are another area under close compliance scrutiny. For example, drug labels that look alike and medications that sound or look similar can lead to an adverse drug event. But, using tall-man or mixed case letters and look-alike/sound-alike drug caution labels have proven to reduce mistakes. And, although a compounded medication doesn't contain the package labeling from the manufacturer, there are still specific guidelines that must be followed. For example, the use-by date, name, strength, and quantity of active ingredients are just a few of the required fields. But, the font size or style, lack of background contrast, designs that hide information, or overcrowded information often make the label unreadable. Instead, use colors and increase the contrast between the text and background tones to make your labels instantly better. In 2018, The Joint Commission revised the requirements for oxygen cylinder storage. Although storing full and partially full cylinders together is acceptable, keeping empty cylinders with the others violates TJC compliance guidelines. 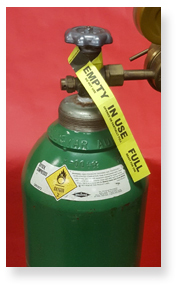 Labeling your cylinders with a durable Tyvek band or equipment tag makes status identification easy. It allows you to record the specific cylinder status, improves staff efficiency and maintains TJC compliance. Among their numerous responsibilities, Biomedical and Clinical Engineering operations are tasked with inspecting, testing and maintaining equipment. This includes recording medical equipment on the medical equipment inventory and performing safety, operational and functional checks. Recording the outcomes of those checks is an essential part of their responsibility. Detailing the data in inventory records and on the equipment after testing and calibration address a key element of performance. During surveys, The Joint Commission identified sterilization and high-level disinfection as two areas that are often not compliant. In fact, it was one of the most frequently scored standards in 2018. So, here is a useful step that can mitigate sterilization and disinfection challenges. In your sterilization records, document that pressure, temperature, and exposure time have reached the levels recommended by the sterilizer manufacturer. And to provide visual evidence that medical devices have reached the proper sterilization levels, use chemical indicator tapes, strips, or tabs, like autoclave labels. For 2019, TJC added nine new performance elements. One covers “distinct” methods of identification for newborns. It requires standardized practices for identification banding and leveraging communication tools such as name alert warnings to aid the staff. Furthermore, it states you should use at least two patient identifiers when providing care, treatment, and services and avoid handwriting on inserts. Maintaining compliance is a non-stop process. And, although there are significant clinical complexities, integrating labels into your workflow helps improve staff communication, patient care and compliance. UAL stocks more than 4,000 products, many that address the compliance standards set forth by The Joint Commission. Browse our website or contact us to learn more.